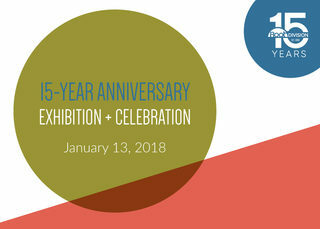 Join us for these fantastic events and special projects to mark our 15th Anniversary of connecting creativity and community in San Francisco and beyond! There’s so much to celebrate! In the past 15 years, Root Division has surfaced as one of the primary venues in San Francisco that supports emerging visual artists. Existing as a dynamic hybrid of the alternative space, commercial gallery, art center, and studio facility, Root Division is contributing to making life as an artist in the Bay Area a sustainable practice while cultivating artists who give back to the community. As we launch into our next 15 years of supporting artists and arts education in the Bay Area, we invite you to take a look at our history and become part of our future." The 15-Year Anniversary Exhibition features 15 alumni from Root Division’s Studios Program, producing high caliber work in a variety of media. We are proud to highlight the work of these artists, each of whom remain deeply involved with Root Division’s community, and whose careers have been catalyzed to some degree by their time as a Root Division Studio Artist.